The San Juan Hut System is a series of backcountry cabins and travel routes allowing year-round tours of the remote mountains and arid desert plains of southwest Colorado. The San Juan Hut System provides winter travel routes across the San Juan Mountains and summer bike routes from southwest Colorado to Utah. The winter huts can be reached individually or continuously from Telluride to Ouray. Huts are booked on a first-come, first-served basis so call ahead for reservations. Inspired by the hut systems of Europe and Canada, the San Juan Hut System is a unique and exciting way to experience the backcountry with the aid of your touring skis or mountain bike. 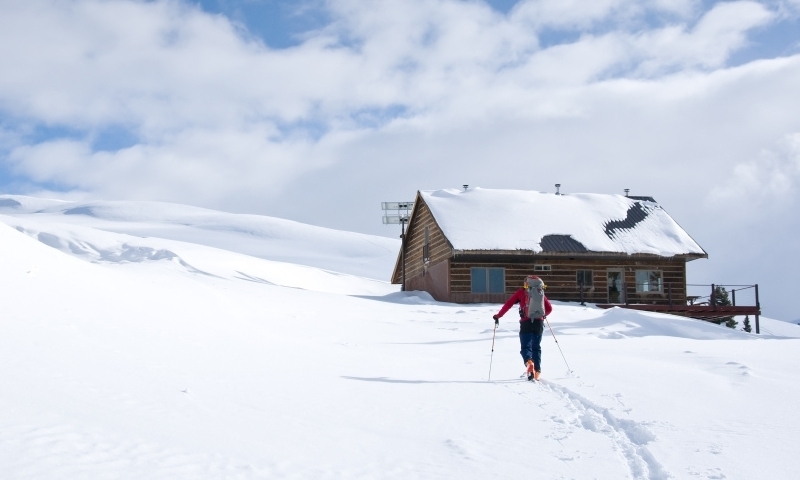 A series of Nordic ski trails and huts stretch along the Uncompahgre Range, and two hut routes connect Telluride and Durango to Moab in summer. With room for eight in each hut, bring your friends and your appetite for adventure. There are two different 215-mile mountain bike routes in the summer, one connecting Telluride to Moab, and the other running from Durango to Moab. The routes follow dirt road and single-track from the rugged and rocky San Juans to the arid slick rock of Utah’s red desert. Each hut is spaced about 35 miles apart to keep the travel distances consistent. The five winter huts connect Telluride to Ouray along the north aspects of the Uncompahgre Range. Each hut has an individual trailhead or can be accessed by way of hut-to-hut trails that can take between three and eight hours. The individual trails into the huts vary. It should take about three hours to ski into the Last Dollar, Burn and Blue Lakes huts. The Ridgway and North Pole huts should take about four to six hours. The winter trails were designed to avoid steep and challenging (and potentially dangerous) slopes, but several huts are situated next to ideal north facing ridgelines with big lines and lots of powder. The San Juan huts have food, water, a propane and wood stove, bedding and cookware. The huts are should be booked in advance, as they are scheduled on a first-come, first-served basis. Each hut can sleep up to eight guests. Call (970) 626-3033 for more information.